The fifth meeting of the year, consisting of 11 races for trotters, was held yesterday afternoon at the Marsa Racetrack. The two most important races were the semi-finals from the Assikura Championship for Gold Class trotters on a short distance of 2,140 metres. Quito De Neret and Prince Gaillard prevailed in the two semi-finals from which 10 horses qualified for the final stage. Driven by Noel Baldacchino, Quito De Neret secured its second win in a row in the first Gold semi-final. This French 11-year-old trotter led all the way, winning easily by two lengths from Record Du Mexique (Marvin Cauchi). Quel Homme (Rodney Gatt), Quel Imprevu (Carmelo Micallef) and Ofackevo (Julian Farrugia) followed home in that order. In the second Gold Class semi-final, the early leader, Starfirefinnfemfel (Julian Farrugia), began to slow down considerably around 200 metres from the finishing line. This trotter was eventually overtaken in the final straight by Prince Gaillard (Charles Camilleri) which obtained its first win of the season by half-length from Wies Buitenzorg (Eric Bezzina) and Cowboy Party (Chris Cassar). Quermes Rush (Anton Cassar) and Starfirefinnfemfel also booked their place in the final. Yesterday’s card also included two races for Premier Class trotters. In the first one, Danish Nico Oland (Julian Farrugia) upped its pace along the final 700 metres and cruised to its first win of the year by a length from Madam Di Poggio (Noel Baldacchino). Zwack (Eric Bezzina) and Wiss Roadrunner (Mario Farrugia) finished third and fourth respectively. Absolut Spender (Mark Desira) had to go all the way in the last few metres of the second Premier Class race in order to stave off the challenge of Quebir De L’Aube (Clint Vassallo). Absolut Spender registered its first win of the year with P.A. Surprise (Lorraine Cunningham) and Quiet Du Chene (Noel Baldacchino) claiming the other top-three positions. 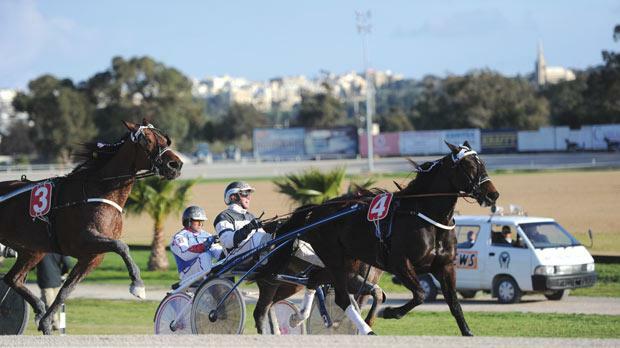 The next meeting at the Marsa Racetrack will take place on Sunday. The first of 11 trotting races gets underway at 1.15pm. Race 1: Copper, Jens (Carl Magro) – 1.18.9”. Race 2: Copper, Tornado Hornline (Charles Camilleri) – 1.20.2”. Race 3: Silver, Paolin De Bannes (Julian Farrugia) – 1.17.1”. Race 4: Gold, Ripsos De Fa (Ivan Bilocca) – 1.16.4”. Race 5: Silver, Rumeur (Rodney Gatt) – 1.17.3”. Race 6: Assikura Championship semi-final (Gold), Quito De Neret (Noel Baldacchino) – 1.15.5”. Race 7: Silver, Zwinger Bobber (Rodney Gatt) – 1.17.1”. Race 8: Premier, Nico Oland (Julian Farrugia) – 1.15.7”. Race 9: Assikura Championship semi-final (Gold), Prince Gaillard (Charles Camilleri) – 1.16.6”. Race 10: Premier, Absolut Spender (Mark Desira) – 1.16.2”. Race 11: Gold, Rex Du Braud (Charles Farrugia) – 1.15.2”.